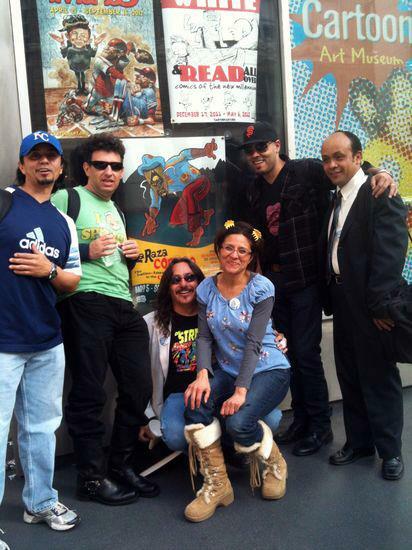 I got home this past Monday evening from the long weekend in San Francisco for the Latino Comics Expo. 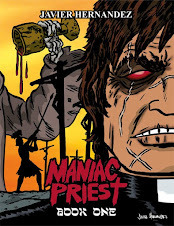 Tuesday morning, I was right back to work on a new comic book, back to teaching my comics workshops, and squeezing in a screening of THE AVENGERS during the week (loved it, by the way!). But I realized I had better get to blogging about the Expo...! This year's Expo was once again held at the Cartoon Art Museum. Many thanks to the Museum for hosting us once again, with special mention to Curator Andrew Farago, Executive Director Summerlea Kashar, Board of Trustees Chair Ron Evans, and the delightful Elena Diaz for assisting us day and night. The Museum will have several exhibits running simultaneously, and one of the other shows was the Mad Magazine retrospective. No shortage of gawking and geeking out on that show, and that was just us artists! A page from my WEAPON TEX-MEX Vs EL MUERTO. I stayed at the home of Ricardo and Rosalind Padilla for the weekend, and after the art opening we went back to their place and watched MASTER OF THE FLYING GUILLOTINE! Nothing like a little kung-fu cinema when running an Expo, ya know? Saturday we woke up to stunningly beautiful, sunny weather, but luckily the crowds showed up to our first day of the Expo. We had a rich variety of creators exhibiting there, some debuting their new books, others being long-time, well-traveled convention exhibitors. 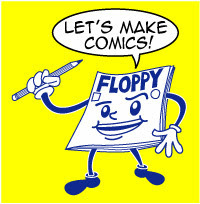 We had creators working on web comics, zines, comics and graphic novels, even animation. I was giving out copies of the new BATICALACA Poster Comic, and luckily we had lots of kids show up, as the comic was created for an all-ages audience in mind. I hosted a panel called 'Mythology in Comics'. It was fascinating to hear the panelists discuss their approaches to incorporating Mexican myths and folklore into their stories, as well all varied in our methods and reasons. One of our panelists, Rodolfo Mendoza, is from Mexico (currently living in Utah), so we assisted him with translating his responses to English (thanks to Isis and Ricardo for pitching in!). L to R are Isis Rodriguez, Adriana Garcia Cabrera, Daniel Parada & Rodolfo Mendoza). Another memorable event that occurred at the Expo was that the curator of the Latin American, Mexican American & Iberian Collections at the University of Stanford came to the Expo. He and another representative walked through and purchased from the artists 3 copies of every work they had. They actually bought my entire inventory of EL MUERTO COLLECTOR BOXES I had brought with me! While it's always great to have such a great sale, what really is special is having your work included in such a collection, particularly from such an institution as Stanford. 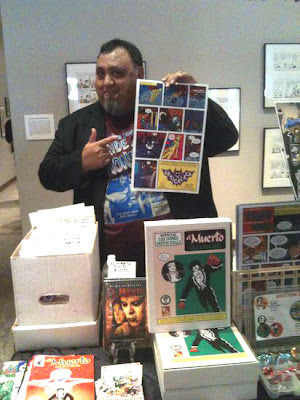 When someone wants to study the history of Latino comics and creators, my work will be available for research, alongside many other works by other artists. Yes, yes, I know we have Google, but good old-fashioned physical research can't be beat! Saturday evening was time for another get-together, this time hosted by our friends at MISSION: COMICS & ART. Get a bunch of cartoonists together at a comic shop, add Sangria and some other 'drinks', and well, you got yourself a party! Las Cartoonistas! L to R, Isis, Crystal Gonzalez, Gabrielle Gamboa, Grasiela Rodriguez and Liz Mayorga. Me and the charming Crystal. And yeah, I'm sporting my stylish Ed Wood 'Bride of the Atom' t-shirt and vintage 1976 Howard the Duck presidential campaign button! Sunday was another day of beautiful weather, and more Expo excitement! I really enjoyed hearing from the folks who visited the Expo. One elderly gentleman, I believe his name was Bob, was telling me about the first Latino in professional baseball (Luis Castro, playing for the Philadelphia Athletics in 1902). Bob was telling me how Luis died poor and in obscurity, with no tribute or tombstone to mark his passing. 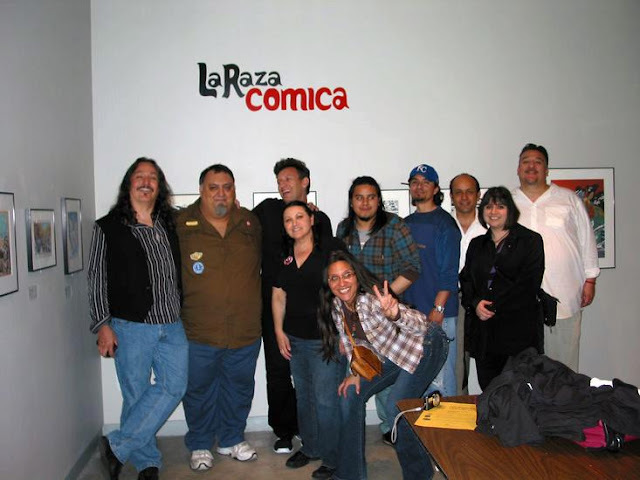 He told me he had no idea there were 'Latino comics' and he hoped that we would all leave a mark and not end up in obscurity, like Mr. Castro. There was sincerity and true emotion in Ben's voice, and it was really touching to hear him express his concerns. I told him that was the reason that we created a Latino Comics Expo, so that creators of Latino descent could gather together and share their work with readers. I also assured Ben that I make as much noise as I can about my own work, whether people want to hear about me or not! 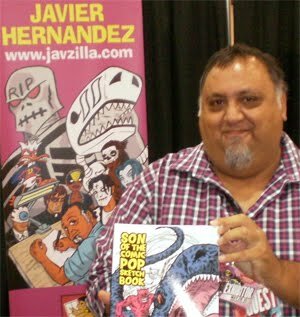 On Sunday, we had another panel with Mario Hernandez, this time he did a reading from one of his comics and had a Q&A with the audience. Mario was a guest last year as well, and he's a complete pleasure to talk with. The first thing he said to me when I saw him Friday evening at the art opening was "I just saw THE AVENGERS and I loved it!". Now that's the way to start a conversation in a comics museum! Being a co-founder of this particular event fills me with a huge amount of accomplishment. The reaction from the artists and the community of fans convinces me that this is a very important thing that we do, this love of comics as our storytelling device. And the reasons we do it, the influence we each get from our individual experiences, and the impact it has on the people, both within and outside the Latino community, well, the rewards speak for themselves. Thank you for reminding me what a special weekend that was. Gracias to all the artists, volunteers, and familia who helped us make History. We did it! Hey from the Cartoon Art Museum bookstore! 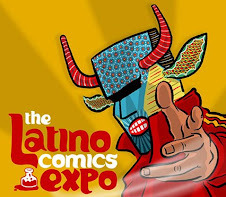 I was so glad that I was able to be here this year for Latino Comics Expo! This is such an amazing event and it was so much fun to be a part of. I will get pics that we took to you soon. Thanks for sharing! It was a fun event and seeing all the artists with their comics and art was amazing. Wish I could have stayed a bit longer.Definitely looking forward to the next Latino Comic Expo.